At New City we strive to come alongside parents and caregivers to provide love, service, and support as we carry out the mission of New City Church: making disciples. Period. We believe the Bible is not just a bunch of flannel-graph stories that teach moral lessons, but rather it is God’s story of who He is, what He has done, and what our response is. We teach that the truth of the Gospel—that Jesus is everything—is accessible to everyone. Children learn about God and this amazing world He has created and how Jesus has come to make all things new. But a truly effective childrens’ program is not one that takes the place of parents but rather enforces, encourages, and equips parents and caregivers with the tools they need to perform the roles God has given them. We want to see entire families grow together in Christ. Currently, we offer infant and toddler nursery during our worship service. Every adult who serves during the worship service has been carefully screened and a background check has been performed to ensure your child’s safety. We want you to know that your child is in good hands so that you can enjoy your worship experience. 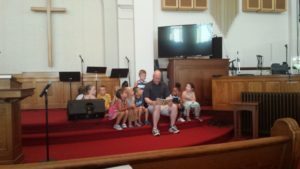 We provide a children’s lesson during the preaching portion of the message. Our teachers are currently using Truth:78 curriculum on the ABC’s of God. We offer activity packs for children to use during the service if you would like them to remain in service. We like having our children in the worship service because it goes back to our core belief that worship is intended to be experienced as a family.